ectively down. Big players such as Amazon, Google, IBM, Microsoft and Sun Microsystems have established their data centers for hosting cloud computing applications in various locations around the world to provide redundancy and ensure reliability in case of site failures. 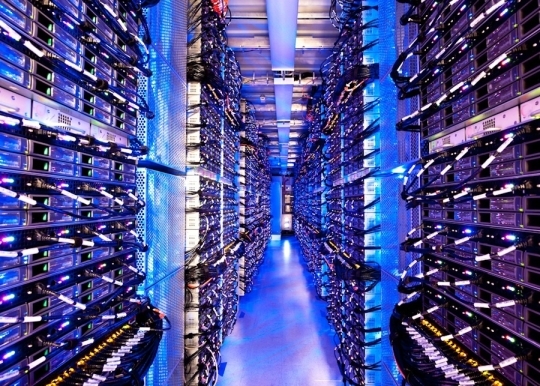 The figure below illustrates an example of a server farm in one of data centers for one of the big providers of cloud computing resources. Broad network access: Capabilities are available over the network and accessed through standard mechanisms that promote use by heterogeneous thin or thick client platforms (e.g., mobile phones, laptops, and PDAs). erent physical and virtual resources dynamically assigned and reassigned according to consumer demand. There is a sense of location independence in that the customer generally has no control or knowledge over the exact location of the provided resources but may be able to specify location at a higher level of abstraction (e.g., country, state, or datacenter). Examples of resources include storage, processing, memory, network bandwidth, virtual networks and virtual machines. Infrastructure as a Service (IaaS): Provision resources such as servers (often in the form of virtual machines), network bandwidth, storage, and related tools necessary to build an application environment from scratch (e.g. Amazon EC2, GoGrid, Eucalyptus, Rackspace, Terremark, Joyent). Platform as a Service (PaaS): Provides a higher-level environment where developers can write customized applications (e.g. Microsoft Azure, Google AppEngine, Cloud Foundry, Appfog, Gigaspaces). The maintenance, load-balancing and scale-out of the platform are done by the service provider and the developer can concentrate on the main functionalities of his application. gure, run or use the software applications on their own computing environments.